Luxueuze Bay Harbor Resort prive-gated community. Ligt hoog op een klif biedt een spectaculair uitzicht op Lake Michigan en Harbor Springs / Petoskey uit drie volledig ingerichte dekken. Onbelemmerd uitzicht op Lake Michigan. Zomer of winter de zonsondergangen zijn onvergetelijk! Gastronomische keuken volledig ingericht, eethoek, en een snackbar. Grote kamer met gas open haard, TV, DVD, en stereo - maar waarom zou je iets wilt doen, maar kijken naar Lake Michigan en genieten van uw favoriete drankje. Gas grill op een groot dek uit grote kamer, eettafel voor zes en loveseat om zonsopkomsten en zonsondergangen. Master suite met een extra diep bad en aparte douche, doorwall naar balkon met uitzicht op Lake Michigan. Dakkapel slaapkamer met drie aparte bedden, twee kasten en TV / DVD. Derde slaapkamer met een queen-size slaapbank, een televisie en een balkon. Wasmachine en droger, aangebouwde garage, en een eigen ingang. Professioneel ingericht. Overdekt zwembad en hot tub binnen 200 voet van het gebouw. Wereldklasse Bay Harbor Golf Club, Boyne Mountain, Boyne Highlands en Nubs Nob binnen enkele minuten. Winkels, restaurants en entertainment op de site. Minuten van de stranden, skiën, snowboarden, sneeuwscooter, en winkelen. Vele uitstekende openbare golfbanen binnen 15 minuten. Charmante Petoskey is drie mijl, Harbor Springs 12 mijl en Charlevoix is ​​15 mijl. Gelegen in de prive-gated community van Bay Harbor, Michigan ..., Northern Michigan premier Golf, Varen & Skiing gemeenschap. Golfers zullen genieten van deze Top 10 best beoordeelde cursussen, Watersporters zullen genieten van een van de top 10 havens in Noord-Amerika en Michigan's beste skigebieden ligt binnen 15 minuten van de flat! In gemeenschap restaurants zijn onder andere: Cava (fijn dinng en live entertainment in de woonkamer), Knot slechts een bar (pub in de jachthaven), Original Pancake House. Petoskey biedt fijne en casual dining opties - controleer de steekproef menu's in onze keuken! Juni tot en met september een week minimum VERHUUR !! Let op: de maximale # van de gasten is 6 (dat is inclusief alle kinderen per brand code). Master bad - twee wastafels, aparte 6 'bad en inloopdouche. DVD / VCR, niet roken. Geen trailers of boten op elk moment !! Geen huisdieren - geen uitzonderingen. Gelieve slechts 7 dagen minimale vragen in te dienen volgens het tariefschema. 3 dagen verhuur alleen zoals beschreven in tarieven in het laagseizoen. Bedankt voor je medewerking. My two daughters and I stayed at this lovely townhouse for a week. What a wonderful trip! 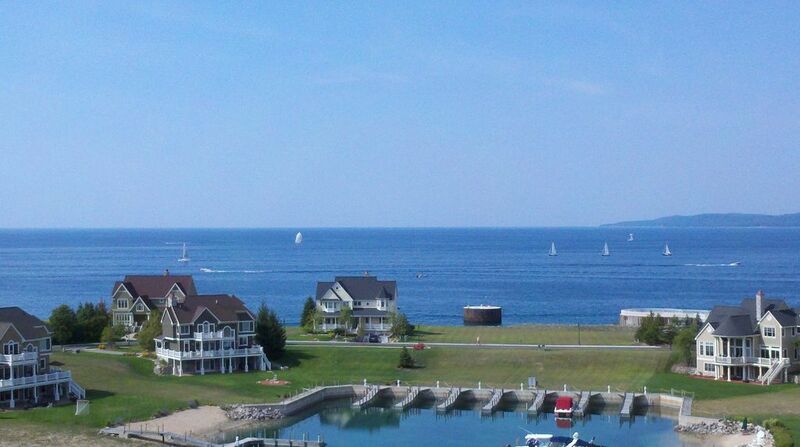 Close to downtown Petoskey, the Bay Harbor shopping area, and Harbor Springs. Well equipped kitchen with a lovely deck for dining al fresco. And the view - breathtaking! Robbi was so responsive and easy to work with. She anticipated our every need. We absolutely intend to visit again! We are a group of long time 6 girl friends who love to get away together and have fun. We loved this condo unit! It has everything! Large enough to be comfortable! The best part is the view from every window of Lake Michigan. The condo is decorated tastefully and is very clean. Lots of things to do nearby! Excellent! The owner was easy to work with. No problems from us! We just returned from this lovely home ( Grandparents, Parents, and Grandchildren) The views of Lake Michigan were breathtaking and the condo really feels like a loved and well cared for home. All of the beds were very comfortable and linens were of great quality. We were delighted with the cleanliness and quality of every element. The Children loved the swimming pool which is just 2 doors down. I highly endorse this location and the owner is easy and delightful to work with. The pictures on the website do not do justice to this lovely, beautiful condo. Our family thoroughly enjoyed the accomodations, location at Bay Harbor, and proximity to beaches, bike path, and Petoskey. We would love to return. The condo is underrated by the owner. The amenities and the decor are fabulous. The sunets from the deck were fabulous and there is no better place for dinner than the deck overlooking the lake. I have been waiting almost a year to write this review, but the posting was taken down after our visit. Although this condo is beautiful, our experience when we first arrived and our experience with the renter was horrible. It should also be mentioned that this condo is an upstairs unit, so if you have a problem with steps, this condo is not for you. When we first arrived at the condo there was a notice on the door from the city stating that the water had been shut off because a bill wasn't paid. The heat was not on and it was freezing. We spent the next three hours trying to get the water turned on, the hot water heater working and the condo warm. Did I mention I had a one year old to handle during all of this. The phone numbers posted throughtout the condo to contact the owner were invalid. Needless to say our first evening of our vacation was ruined dealing with all of the owners errors. We tried contacting the owner after our stay to let her know what happened and that we would like a little compensation. We never heard back from her and the posting was removed for us to write a review. If you choose to rent this condo, enjoy but beware! A three day renter filed a review that is unfair. The issue was the water heatrer is unpluged and the water main shut off in the mechanical closet for safety reasons. The condo is an upper unit and with owners gone for 6 months the water is turned off so that in the event of freezing or water heater leaking, there is mininmal damage to lower units, if any. The renter had my current Florida phone number from all communication and did not call me at the appropriate number. There is instruction for fall/winter renters to plug in hot water heater and to turn lever on water main both easily accessible. Heat is turned down to 55 by the association and the small 2100 sq. ft. condo heats up very quickly and there is a gas fireplace to expedite heating the living areas. Water bill is not forwarded to Florida since it is a tax and water was not turned off just a notice to pay the bill which my neighbor notifies me. The renter just wanted me to refund an already reduced rental to her. NOTE- in Summer minimum of 7 night rental. 4th of July a minimum of 14 night rental. Single car garage is included with parking for one additional vehicle in the driveway 50% of the Rental Rate is due to secure your desired dates. At check In, the Damage Deposit (Security Deposit - $500) and the Exit Cleaning Fee ($200) and the State and Local taxes are due with the remainder of the rental rate. Please contact for additional information on rates, accommodations or any questions.